Just launched new Ti in minor surf and at one point got distracted and allowed a wave to turn the boast sideways and port ama hit sand in 2 ft of water. 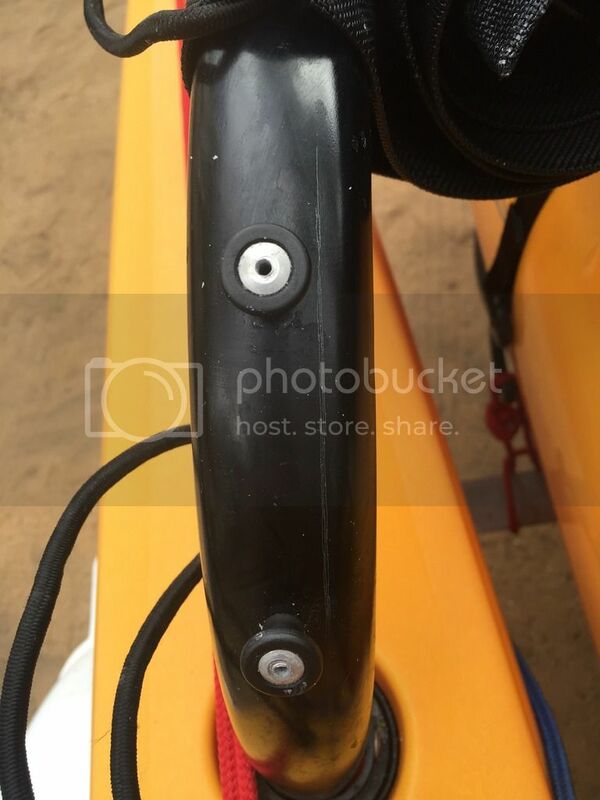 After sailing for 2 hours, I noted on beaching that port aft aka is bent slightly and forward one is bent and cracked linearly along the bend into the ama. I'm amazed the boat did so well, but I assume I need to replace both fore and aft akas. Anyone else have this happen? Seems like a minor trauma but it may cost me over $US200. I haven't bent or cracked my akas, but I have tapped the dock at the boat ramp and snapped the shear pin. I'm surprised you did break the shear pin when it hit the sand. Maybe because it hit side on instead of front/back the force wasn't in the right direction to break the pin? I don't know why the shear pin didn't break. We pedaled around for 20 minutes when all of a sudden the left from aka pulled out of the cross brace right at the pivot hinge. I had a hell of a time getting that to reseat. Had to pound on it with the palm of my hand, and it eventually clicked into place. 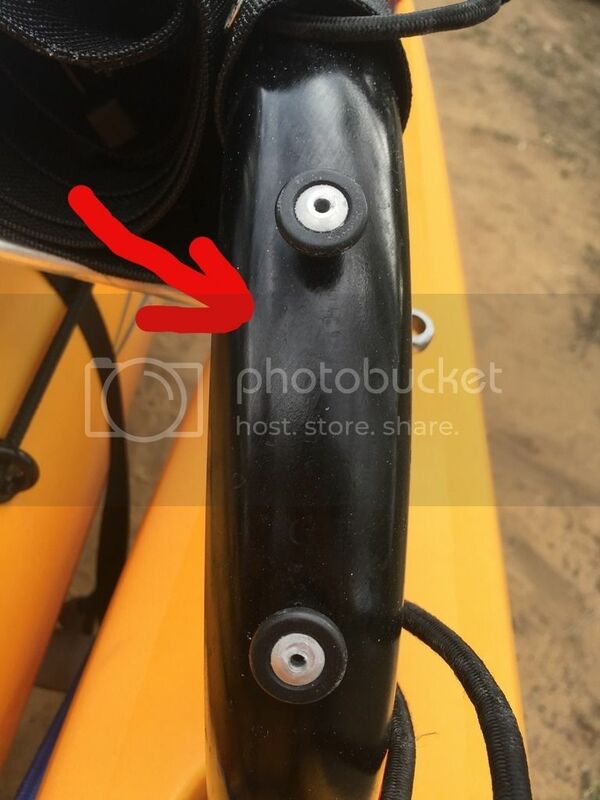 Hobie dealer where I went this AM says he has never heard of an aka bending or breaking like that. He has sent details to Hobie to see what they think. The pin is more likely to break with a fore / aft impact. You hit sideways. The pin is not designed for safety release in lateral loads. Not surprised that you bent something. Sideways in surf... weight of the boat and crew being pushed by hundreds of more pounds of water force to sudden sideways impact on the sand. Yup. That's just how fast it happens. Just be thankful the sail did not dig in and do further damage. Myself and others have experienced similar issues with the aka's cracking and bending, but not just on the TI's, on the AI's too. Stress lines have been spotted over the outside of the bend on AI/TI's that haven't been bashed around in adverse conditions. I'm starting to think that since they upgraded the outriggers in length, Hobie should have strengthened the aka's too!! This is a photo of a stress line that has formed on my AI's Left front aka. This is a photo of a stress line that has formed on my AI's Left rear aka. This is a photo of my AI's Right front aka, there is no stress line, but there is some inwards deformity in exactly the same location as on the others, (noting that it must be a manufacturing fault as its exactly the same location if you where to put them all side by side). 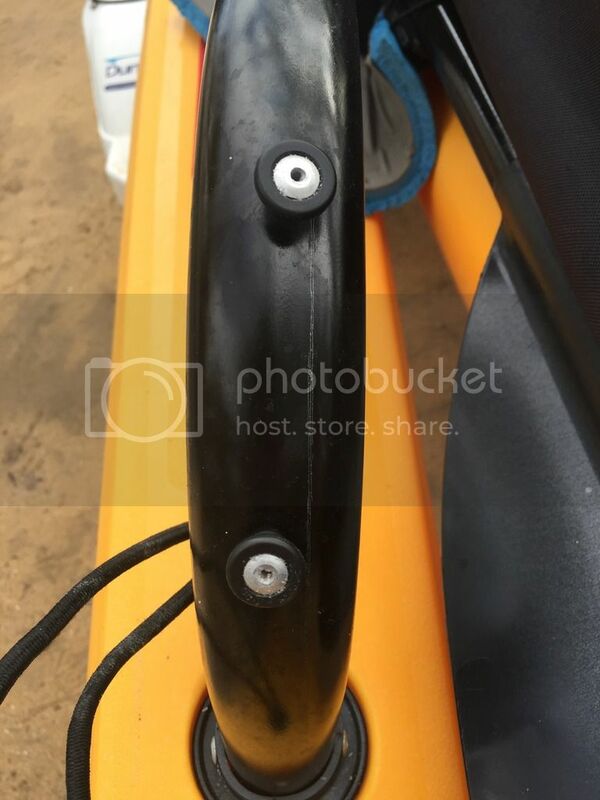 This is a photo of my AI's left front aka knuckle, the aka tube has considerable play inside the knuckle that has caused the retaining rivets to come loose. 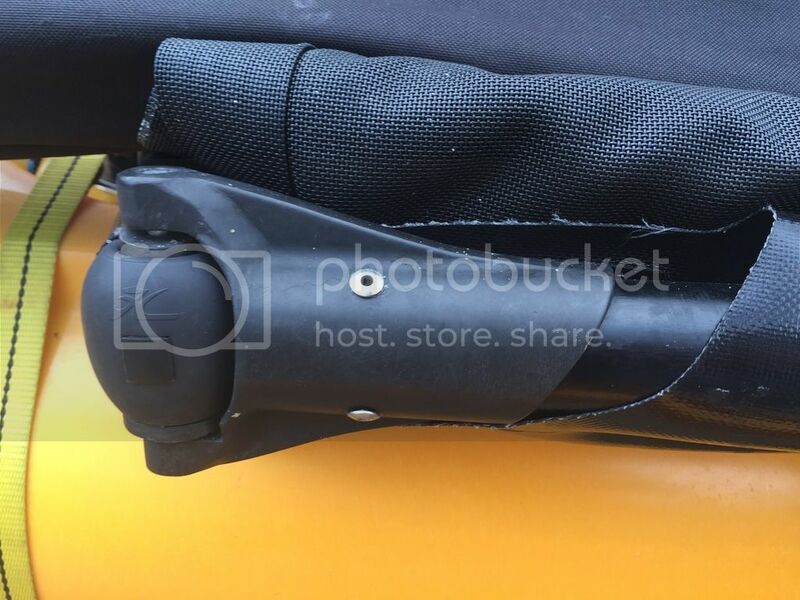 2015 Hobie Adventure Island in Golden Papaya "Sail-Fish"
"30-40 mph with full sail" That's impressive, and I'm not surprised you broke a shear pin with insta-capsize. Where are you located? You can put your location on your profile, so we know where you are located easily. I'm curious why the waves were small in 18' of water with such strong winds? What was your source for the strength of the winds? Stress lines have been spotted over the outside of the bend on AI/TI's that haven't been bashed around in adverse conditions. Fyi... extrusions are created by pushing material through a die. The core that creates the hollow center is held by pins, so the material has to flow around the pins and re-attach / fuse together on the exit side of the die. These die lines are often visible. Sailing in winds higher than locally rated small craft advisory levels (they vary by region and body of water) is taking a personal risk that can not be condoned by Hobie Cat. This is not a warranty issue.